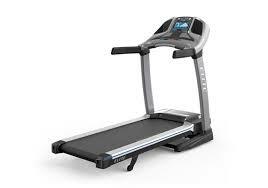 The Elite T9 is a full-featured, premium treadmill from Horizon. An upgraded version of the Elite T7, the T9 boasts of a high-quality drive system, maintenance-free tread belt, large collection of workout programs, full-color touchscreen display, and interactive features like Passport and ViaFit. Footprint : 78.75" x 39.38" x 63"
The Elite T9 comes preloaded with a nice amount of workout programs. They are divided into various categories like step, distance, calorie burning, and interval training and are designed to help you reach your fitness goals faster. You get an impressive 40 altogether, 2 more than on the new Elite T5 base model. Just like the Horizon Elite T7, the treadmill features the innovative Infinity tread belt, which requires no lubrication whatsoever. The belt’s fibers are permeated with synthetic hard wax, as a result of which the belt stays lubricated all the time. So, there is no need to wax the track from time to time like you do with other treadmills. • It automates the process of fitness tracking. Every time you work out, the stats are uploaded to your ViaFit account instantly. • It shares your workout data with other fitness tracking apps and online communities. • It gives you a clear picture of your fitness progress with charts, illustrations, and graphs. Any time you want, you can log into your account to see how you have progressed and how close you are to achieving your fitness goals. • Above all, the ViaFit app is absolutely free. There are no hidden costs or paid upgrades. You can set up an account in minutes and start tracking your fitness data instantly. Indoor running can be boring. To make it more exciting, the Elite T9 brings you the exciting Passport technology. The feature uses Wi-Fi to connect your TV and treadmill. Once the connection is established, you can watch HD videos of beautiful landscapes from different countries. The treadmill is synced to the video displayed on the screen – which means the incline and resistance will change automatically to simulate the surface of the terrain in the video. You need the Passport Player to be able to access this feature. It is sold separately. However, the Elite T9 has two destinations – the American Southwest and Northern Italy – built into the console itself. So, you can watch the videos on the touchscreen and enjoy a thoroughly immersive workout experience. The deck has three different cushioning zones. The front end is heavily cushioned to absorb the impact when your foot lands. The back end is lightly cushioned to offer you a firm lift-off area to gain momentum for your stride. The middle layer is moderately cushioned for a smooth transition. The T9 has contact grips and a wireless chest strap to measure your heart rate during the workout sessions. The wireless strap, in particular, monitors your heart rate with great accuracy and allows you to stay in the right zone for improved results. The Elite T9 inclines up to 15% and has a top speed of 12 MPH. It comes with a 8.5″ display, tablet rack, bottle holder, and a sound system with built-in speakers. It is also easily foldable and takes up very little storage space. This is a common complaint with Horizon treadmills. The combination of incline and decline training allows you to simulate running up and down a hill. It not only makes the workouts more challenging, but also helps you prepare for marathons and running competitions. So, the lack of a decline training option, especially at this price range, is disappointing. The 8.5″ backlit display is bright and easy to use, but many other treadmills in this price range offer a fully web enabled touch console. The Elite T9 is undoubtedly a high-quality treadmill. It is, however, very similar to the Elite T7 in terms of features. The only difference is that the T9 has a more powerful motor and a larger deck. Some people might not be comfortable with paying an additional $400 for the small upgrade in features. The Elite T9 is a very good buy, if you can get it at a discount. It faces stiff competition from other treadmills in the same price range like the ProForm Pro 9000 and NordicTrack Commercial 2450. So, you might want to take a look at them before making a final decision. You can check out the new Horizon Elite T9 treadmill on the company site for the latest sales and to take a look at the features in more detail.